It's summer. The kids are out of school and it's time for the family vacation. While Florida is one of the top vacation destinations in the nation, summer travel in the Sunshine State can present some challenges — not the least among them is the heat, crowds, and budget-busting costs. If you're planning to travel in Florida during the summer, I've gathered some resources on the next few pages that address these challenges to help make your trip a little easier... and a whole lot more fun! First, take a look at these handy month-by-month guides to weather conditions, weather forecasts, water temperatures, the best time to go and special events. What's the Best Way to Get to Florida? Now let's decide exactly how you will be getting to Florida. Since gasoline prices and airline tickets are all over the place, deciding whether it is cheaper to drive or fly is getting more difficult. Air Travel in Florida - Flying? Here's the information you'll need on airlines and airports serving Florida. Driving In Florida - If you're driving, then learn all you can about getting around Florida by automobile — includes maps, travel tips, why you may need a SunPass and more. Florida's climate is among the best in the country, but the summer heat can be a killer and afternoon thunderstorms bring the threat of dangerous lightning. Learn more about Florida's climate and weather, average temperatures, heat index, average rainfall and even hurricanes. Elderly persons and small children, or persons who are on certain medications, overweight, or have an alcohol habit are particularly vulnerable to heat stress; so, it pays to know the heat stress symptoms and learn how to beat the Florida heat. Don't forget about the family pet either. Leaving them in a hot car can be deadly, so here's the inside scoop for traveling with fido. It's important to check out weather conditions in advance, so click below for average monthly temperatures and rainfall, as well as links to current weather conditions. If you happen to get caught with a rainy day during your vacation, there are still plenty of things you can do in Florida when it rains. Enjoy the best rates of the year in Key West and the Florida Keys. Going to Disney World? Disney's value resorts have the best rates, especially in late August and early September. The longer you stay, the more your savings with Disney's "Magic Your Way" tickets. Universal Orlando now offers value- and moderate-priced resorts. If you like to golf, this is the time of the year to get in on special golf packages at your favorite resort. Top 10 Cost-Cutting Travel Tips to s-t-r-e-t-c-h your vacation dollar. Multi-Park Tickets: Are They A Good Deal? - A closer look and cost comparison of multi-park admission tickets. While we're no fan of the Disney on a Dime title, the book does deliver information and advice that will surely save you money on your next trip to Walt Disney World. What are Florida's Top Destinations? It is hard to pick out Florida's best destinations. Of course, Disney World would be at the top of the list, as would our beaches. Here are a few ideas to help you choose the destination that's just right for you and your family. Top 10 Florida Vacation Destinations are my picks for can't-miss places to go any time of the year. 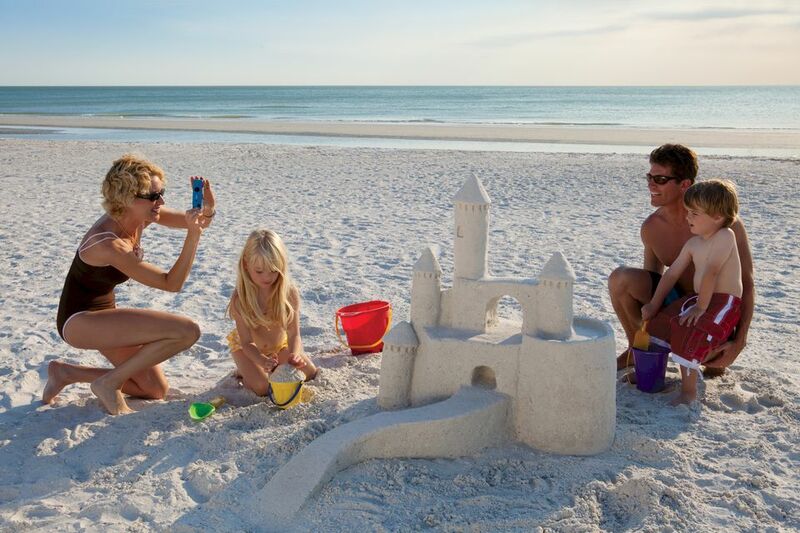 Top 10 Florida Beach Vacations cater to specific crowds that love them just the way they are. Disney World has become Florida's top vacation destination. It's easy to see why — it has a great selection of on-property resorts for every budget, four great theme parks, plenty of shopping and world-class dining opportunities. SeaWorld Orlando is the world's premier marine adventure park with nearby resort hotels for stay and play fun. Universal Orlando is not just an attraction, but a resort too! The beach is always a good choice and Florida has plenty of them. Try my Florida Beach Vacation Planner that includes Florida's beaches from A to Z. Of course, Daytona Beach is perhaps Florida's most famous beach. It's where you can drive right on the beach and is known for its great surf. Amelia Island may be one of Florida's best-kept secrets. It's got it all — friendly southern hospitality and a wide variety of activities, all within such a small area. The island doesn't feel crowded though, remaining one of the most beautiful and natural areas in Florida. Camping in the Florida Keys is always a good bet. If you need to get away for a few hours or a day, these Florida's Day Trips are perfect destinations. I've arranged them by location so you can easily choose one that isn't too far away. Common sense ways to beat the Florida heat. Cutting-edge virtual reality technology and classic Disney imagination await guests when they step inside DisneyQuest, a five-story, indoor interactive theme park where you can spend hours in air conditioned comfort. You don't have to go round and round trying to find a place to get cool in Florida... well, actually, you do go round and round, but you do so while you get cool at Florida's ice skating rinks and arenas. Florida's museums and science centers offer interactive displays and a glimpse into art and history of the state... and most exhibits are inside. You can even run away for a day at the Ringling Circus Museum in Sarasota! Encounter the wonders of Florida sea life while visiting the Tampa Bay area at The Florida Aquarium. And, don't forget that Florida's water parks are a great way to cool off and have lots of splish-splashing fun too! Florida's water parks offer a splish-splashing good time for summer fun! Try a paddle-perfect canoe getaway amid Florida's waterway wonderlands. Disney World is loaded with get-wet action! Perhaps renting a jet ski is your idea of fun. Learn the ins and outs of renting a personal watercraft in Florida.